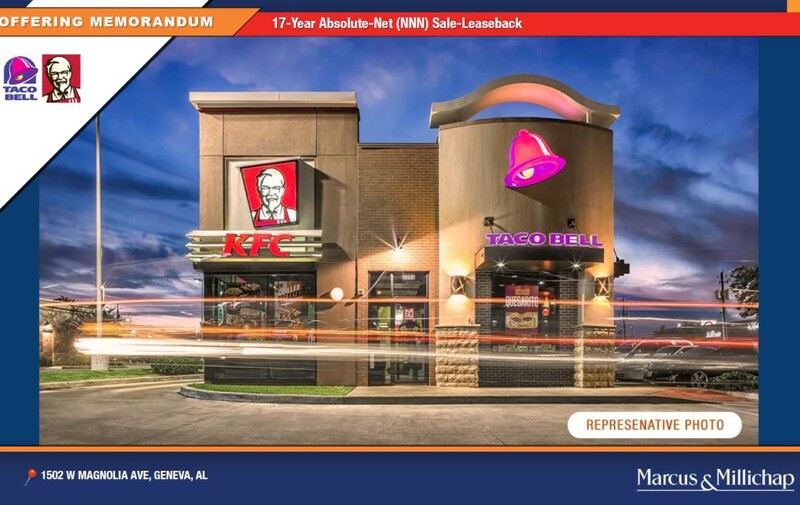 Marcus & Millichap is pleased to present this KFC located at 1502-A Magnolia Ave, Geneva, AL 36340. The subject property is a 2,712 square-foot single tenant building on 0.62 acres of land. It is a 17-Year Absolute-net (NNN) Sale-Leaseback with no Landlord responsibilities. The offering provides base rent with 1.5 percent annual increases. 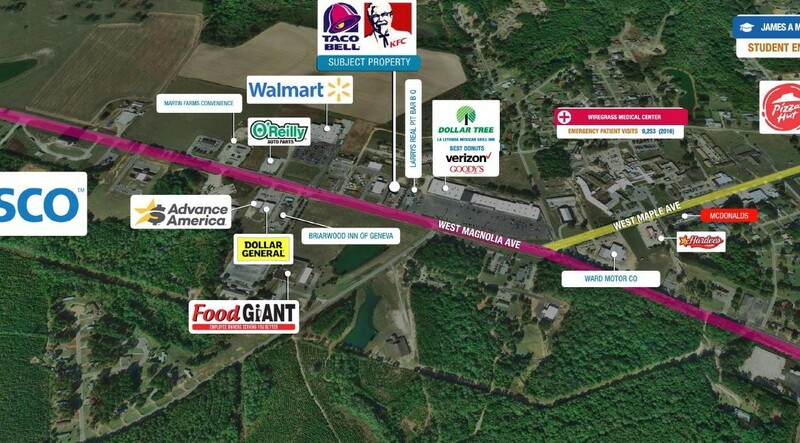 This property is located on Magnolia Avenue in Geneva, Alabama, one of the major thoroughfares in Geneva. The neighboring tenants include Walmart, Dollar General, Dollar Tree, O’Reilly Auto Parts and Hardee’s to name a few. Less than 1 mile down the road is the Wiregress Medical Center. KFC (the name was originally an initialism for Kentucky Fried Chicken) is a fast food restaurant chain that specializes in fried chicken and is headquartered in Louisville, Kentucky, in the United States. It is the world’s second largest restaurant chain (as measured by sales) after McDonald’s, with 18,875 outlets in 118 countries and territories as of December 2013. The company is a subsidiary of Yum! Brands, a restaurant company that also owns the Pizza Hut and Taco Bell chains.